It could be accurately said that the use of electro-acupuncture goes back to the Bronze Age (3000 – 700 B.C. ), when metal acupuncture needles were first used in China. From what we know now any metal needle inserted into the body produces low-level electrical activity, especially when manipulated. Such stimulation is in a similar charge range as what is produced by modern microcurrent devices. The first known electro-acupuncture devices were produced by Dr. De La Fui in France in the 1940’s. His work was carried on by Niboyet. Needle stimulation devices were manufactured in China soon after. Chinese electro-acupuncture devices have mainly been used to stimulate needles for pain relieving effects, or to induce non-drug surgical anesthesia. In modern times electro-acupuncture has been used for both treatment and diagnosis. The first diagnostic systems were developed by Nakatani in the 1950’s (Japan) and Voll in the 1950’s and after (Germany). Both noted that acu-points show different electrical conductivity than surrounding tissues. They designed equipment that could measure changes in acu-point conductivity, and to deliver balancing treatment. They both also developed ways to interpret these readings to reveal pathologies in associated organs and body systems. Voll also discovered that medications placed into an electrical circuit between the measurement device and patient’s body will cause changes in diagnostic readings. This phenomenon opened up the development of electro-medication testing. This has been the aspect of Voll’s work that has created the most interest in recent times. Many devices now produced and sold in the USA are based on this principle. Some of these recommended points are on new meridians discovered by Voll and his colleagues. Further information on Voll’s point and frequency recommendations can be found in my book Microcurrent Electro-Acupuncture, in the Treatment Formulary III section. The prefix “micro” refers to anything measured in the millionths of a unit. “Current” refers to amperage (or amps), the primary unit for measuring electrical current. Therefore microcurrent is electric currents in the millionths of amp levels. Microcurrent devices differ from conventional Chinese electro-acupuncture in that the currents delivered are about 1000 times less intense. Microcurrent devices are also generally designed to be used with greater precision, and often include probe electrodes suitable for treating acupuncture and trigger points in addition to pad electrodes used for treatment of broader body areas. I call the use of microcurrent for acupuncture treatment “microcurrent electro-acupuncture”. Differing effects from various waveforms, frequencies and polarity placements of the electrodes are recognized and applied. Microcurrent has also been proven to accelerate wound and bone healing. As a result of these factors results of microcurrent electro-acupuncture are usually significantly superior to other forms of electro-acupuncture. It is especially valuable for promoting long-term relief of chronic pain, and for healing and tissue regeneration. In 2001 I started adding color light therapy to the Acutron microcurrent probe electrodes. This seriously augmented results. As a form of validation one acupuncturist named Leong from Las Vegas had used several Acutron Mentor microcurrent devices in his pain management practice for over a year with very good results. He purchased two of the new color light probe systems when they were first released. After another year I questioned Dr. Leong about what differences he had noted after adding color therapy to Acutron treatment. He told me that pain conditions that had previously required 10 – 12 treatments for resolution were now only requiring about half that many for long-term pain relief. The only difference was the addition of color light to the microcurrent electro-acupuncture therapies. One of the greatest challenges facing acupuncturists and other holistic doctors is attempting to relieve severe chronic painconditions. Over the last 30 years I have experimented with many techniques for using microcurrent with a wide range of such cases. After many successes and failures I found that a flexible sequence approach produced the best and most consistent results. Sequence therapy is using a series of very brief pain relief techniques,and testing the patient’s improvement after each technique. This method has empowered me to help many patients who had not found any relief previously, even from highly skilled acupuncture services. In my seminars I train professionals how to do the 6 most effective microcurrent electro-acupuncture techniques, and how to apply them in a therapeutic sequence. Lots of my students have reported that this system has boosted effectiveness and shortened treatment times. 1. Faster and more efficient wound healing – Numerous research studies have validated this effect. As an example Carley and Wainapel1 reported the following: 30 hospital patients with non healing ulcers were divided into two groups, one treated with conventional wound dressings and one with microcurrent stimulation at 300 – 700 µA. The latter group was given two – two hour stimulation periods per day. After six weeks of such treatments the group treated with microcurrents showed a 150 – 250% healing rate, with stronger scar formation, less pain and lessened infection of the treated area. 2. Boosting ATP production in cells – ATP is the energy-carrying molecule in cells that powers all activity, including cellular healing. Cheng, et al2 have been widely quoted for confirming how microcurrent boosts ATP production as well as the availability of free amino acids for cellular repair. Most significant was their finding that levels of electrical stimulation above 1000 µA (1 milliamp) actually retarded ATP production. This indicated that only very low-level electrical stimulation has this very desirable effect. 3. Strengthening tendons – Oweye and his team3 reported stronger tendons in rats that had positive (anodal) microcurrent applied, with current at 75 µA, 10 Hz frequency. Many other studies have shown similar effects. 6. Microcurrent may support function of stem cells in healing eye diseases6 – One form of microcurrent stimulated both dermal fibroblasts and U937 cells to secrete transforming growth factor-beta 1 (TGF-beta 1), which is an important regulator of cell-mediated inflammation and tissue regeneration. This article supports the potential of microcurrent to improve the results of stem cell transplantation. 7. Polarized microcurrent used to shrink cancerous tumors7 – B. Nordenstrom, M.D. demonstrated that the positive polarity of microcurrent, passed through needles implanted into cancerous tumors, blocked cancer pain and in many cases caused the tumors to regress or disappear. He theorized that this treatment set up a form of electro-osmosis, which dehydrated the tumor and blocked production of pain-producing substances such as histamine, substance P and bradykinin. Voll did extensive research, using his equipment to apply microcurrent at specific therapeutic frequencies to acupuncture points for treatment of a wide range of diseases. 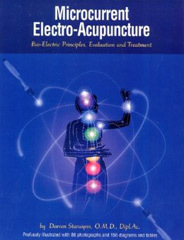 See Treatment Formulary III in my book Microcurrent Electro-Acupuncture8 for details. I believe that some of the effects of microcurrent are still off the charts of traditional science. These would be the ways that low-frequency currents balance and heal the meridian system and chakras – the focus of this book. Many other studies too numerous to quote here confirm that the human body is exquisitely sensitive to low-level electrical stimulation. The polarization (placement of positive and negative electrodes), frequency rate (number of pulses per second) and waveform of the current all produce targeted effects in the body. These effects are elevated when such stimulation is passed through acupuncture points that relate to the pathology being treated. A summary of some of this research can be found in Microcurrent Electro-Acupuncture, Chapter Two. Effects on release of neuro-peptides. These are small molecules used by the body for communication and signaling purposes. In her book Molecules of Emotion9 Candace Pert recounted her research about how neuro-peptides inter-connect the brain, immune system, organs, hormones and our emotions. Although she did not specifically use microcurrent stimulation in her studies it appears from observation that the application of well-chosen microcurrent and light frequencies do have significant effects on neuro-peptide release. Releasing energetic blockage through the body. The ancient art of acupuncture is largely based on using needle insertions to release “bi” or blockage in the meridian system and to clear Blood stagnation. Chinese Medicine teaches that such blockage is a primary cause of pain and disease as well as disorders of the Spirit (emotional imbalances). It has been well established that electrical stimulation passed through acupuncture points, or electro-acupuncture, produces these effects and can amplify the effect of needle therapies. Psycho-emotional pain is also associated with blocked, shut-down parts of the body and psyche. Pioneers in body-centered psycho-therapy such as Wilhelm Reich and Ida Rolf popularized therapies that release tense, blocked body regions to help heal emotional issues. The use of microcurrent in PNE Balancing supports the healing process in similar ways. Release through micro-systems. One of the most remarkable techniques in the acupuncture armamentarium is evaluation and treatment through auricular therapy and other micro-systems. The ear contains a complete map of the rest of the body, as does the face, hands, feet and abdomen. Stimulation of points on the ear corresponding to dysfunctional body areas has powerful effects at rapidly relieving pain and helping correct disorders of the organs, glands and nervous system. Microcurrent may be used through micro-systems to produce these effects. Micro-systems are expressions of the holographic nature of the body – where parts contain a map of the whole body. Chapter 14 details these effects. 6Altern Lab Anim. 2001 Nov-Dec;29(6):693-701. England University of Nottingham, Todd I, Clothier RH Electrical stimulation of transforming growth factor-beta 1 secretion by human dermal fibroblasts and the U937 human monocytic cell line. 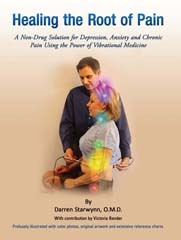 8Microcurrent Electro-Acupuncture, Starwynn 2002, Desert Heart Press (available through Eastwestmed, Inc. (800) 872-6789.